After reading The Portrait of a Lady, I picked up some light reading. 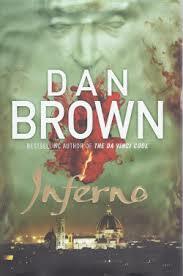 Also taking place in Italy, I thought Dan Brown’s newest book, Inferno, would be a fun read. And it was. Light and fun. I raced through it in two days. Like his other books, it is written in a race. The clock is ticking to solve a mystery steeped in history and symbology and save the world from evil geniuses that not only want to destroy it, but want to hide their plan in clues full of references to artwork, persons, and locales from hundreds of years ago. It is amazing that protagonist Robert Langdon is around to solve such cases. But more amazing, is that there are multiple cases out there for a symbologist to solve. Setting aside the improbability of a history professor from Harvard being needed to save the world numerous times, Inferno was a fun book. It centers around Dante Alighieri and his famous, world changing book, The Divine Comedy. First up, why is The Divine Comedy such an important book? Many reasons. Here are a few. First, Dante wrote it in the common tongue of the time, basically solidifying what would become modern Italian. Secondly, it is probably the book that has inspired the most artwork and literature in the world, second only to the Bible. And lastly, it really firmed up the Catholic church’s vision of heaven and hell. It scared readers so much that it gave the church a huge burst of attendance for hundreds of years after. Now to Brown’s Inferno, the latest book to be inspired by Dante’s work. Waking in a hospital with amnesia, Langdon has no idea how he arrived or where he has been the last two days. Within moments, someone arrives to try and kill him. The race is on. Langdon must remember why he is in Italy, why people are trying to kill him, and why he is having such disturbing visions of plagues and death. His only clue is a strange device found in his pocket, contained inside a biohazard tube. The device leads him and a beautiful blonde doctor who is assisting him, all across Italy in search for the truth. But the real question is, who can he trust? The references Brown uses to different places and pieces of artwork are entertaining. The action is constant. The dialogue is uneventful. And in the end, well, I’d be interested to hear some other opinions. Personally, I was not completely satisfied, but it was certainly unexpected, and that is generally a good thing. The book raises some interesting questions about the planet’s current state of overpopulation, the future of humanity, and the Transhumanist movement. Questions that honestly have left me a bit disturbed, even days later. I don’t know that I expect Dan Brown to make me think so much, but perhaps it isn’t so bad. If you have ever read The Inferno, enjoyed The Da Vinci Code, or like a good historical thriller, this is a book for you. It’s perfect time to make some plans for the future and it’s time to be happy. I have read this post and if I could I want to suggest you some interesting things or tips. Perhaps you could write next articles referring to this article. I wish to read even more things about it!